Below is a list of our school policies. Please feel free to call the studio at (815) 434-5787 for any additional information. Monthly tuition must be paid by the 10th of every month. Tuition paid after the 10th will be charged a 10% late fee. We require all students to place a credit card on file. » CLICK HERE TO DOWNLOAD THE CREDIT CARD FORM. Gray's School of Dance accepts cash, checks, Visa and Mastercard. You may put your credit card on Autobill; a convenient method of making monthly payments. Our season runs from September through May. In September, your September and May payments are due. If any bill is neglected for 2 months or longer the student will be required to refrain from attending classes until the tuition is paid in full. There is a $25.00 charge for all checks returned from the bank. No refunds or credits will be give for missed classes for any reasons. NO EXCEPTIONS. The dress code was designed to encourage unity and discipline among students. Proper dance attire and shoes must be worn in all classes. Leotard and tights must be worn in ballet class! No unnecessary jewelry, shirts, pants or bulky clothing. The teacher MUST see the dancer's body to enable correct alignment and placement of the dancer. Hair must be neat and clean. Long hair MUST be tied back off the face and neck. Registration for fall classes starts in March. There is a $25.00 per family non-refundable registration fee. Please fill out ALL the forms in your packet. Please make sure you have a copy of our yearly calendar with all our important dates. Watch for notes/newsletters being sent home with your children announcing visiting days and extra activities that might occur. Please notify us if you wish your small child to go downstairs after class to be picked up. Otherwise we will keep them upstairs until an adult picks them up. Please remember to label everything clearly, dance shoes, clothing etc. We are not responsible for lost or stolen items. When there is cause for absence, due to illness, vacation, school functions, etc. Please call us so we are aware of the reason for absence. We expect the presence of each student each class day as new things are learned every week and class time cannot be spent catching up one student, unless there is a legitimate reason. Cancellations due to bad weather will be on WCMY 1430, and posted on Facebook. 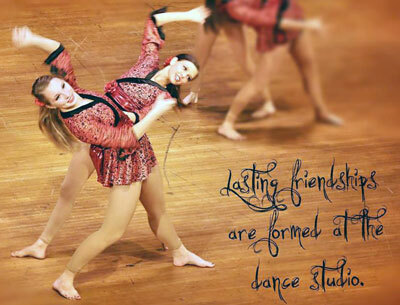 Classes are offered in all phases of the dance from the beginner through the advanced level. Students are moved up to the next level on an individual basis, depending on their ability and attitude. Even if children are the same age, it does not mean they are at the same stage of development. Students are advanced individually and not as a class. Student must work outside of the class as well as during the class to progress. Please trust the decisions of our trained dance professionals to make the right decision in regards to placement of your child. It is requested that parents encourage the students by showing interest and enthusiasm for their efforts. Dancing is hard work, it is concentrated coordination. It creates a quality almost otherwise unobtainable for both you and your child.